Peptide (C)KNDKSDPKVRVKDD, corresponding to amino acid residues 85-98 of rat β4 subunit of voltage-gated Na+ channels (Accession Q7M730). Extracellular, N-terminus. Homology Mouse - identical; human - 11/14 amino acid residues identical. 1-4. Anti-SCN4B (NaVβ4) (extracellular) Antibody (#ASC-044), (1:800). 5-8. Anti-SCN4B (NaVβ4) (extracellular) Antibody, preincubated with the control peptide antigen. Immunohistochemical staining of adult rat dorsal root ganglion (DRG) using Anti-SCN4B (NaVβ4) (extracellular) Antibody (#ASC-044) followed by goat anti-rabbit-AlexaFluor-594 secondary antibody. A. NaVβ4 labeling (red) appears in the cell bodies of the DRG neurons. B. Nuclear staining using DAPI as the counterstain (blue). C. Merged image of A and B. Cell surface detection of NaVβ4 in intact living rat pheochromocytoma (PC12) cells. 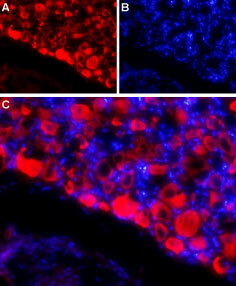 A. Extracellular staining of cells using Anti-SCN4B (NaVβ4) (extracellular) Antibody (#ASC-044), (1:50) followed by goat anti-rabbit-AlexaFluor-594 secondary antibody (red). B. Live view of the cells. Medeiros-Domingo, A. et al. (2007) Circulation 116, 134. Oyama, F. et al. (2006) J. Neurochem. 98, 518. Voltage-gated sodium channels (NaV) are essential for the generation of action potentials and for cell excitability1. NaV channels are activated in response to depolarization and selectively allow the flow of Na+ ions. To date, nine NaV α subunits have been cloned and named NaV1.1-NaV1.94,5. NaV channels are classified into two groups according to their sensitivity to tetrodotoxin (TTX): TTX-sensitive (NaV1.1, NaV1.2, NaV1.3, NaV1.4, NaV1.6 and NaV1.7) and TTX-resistant (NaV1.5, NaV1.8 and NaV1.9) 2,3. Mammalian Na+ channels are heterotrimers, composed of a central, pore-forming α subunit and two auxiliary β subunits. The expression of the α subunit isoform is developmentally regulated and tissue specific. Na+ channels in the adult central nervous system and heart contain β1 through β4 subunits, whereas Na+ channels in adult skeletal muscle have only the β1 subunit6,7. NaVβ4 has been associated with Long QT syndrome8 and with Huntington's disease, showing a distinct down regulation of NaVβ4 in the presymptomatic stage of HD mice, whereas other voltage-gated ion channel subunits were later decreased9. Anti-SCN4B (NaVβ4) (extracellular) Antibody (#ASC-044) is a highly specific antibody directed against an epitope of the rat protein. The antibody can be used in western blot, immunocytochemistry, and immunohistochemistry applications. The antibody recognizes an extracellular epitope and is thus ideal for detecting NaVβ4 in living cells. It has been designed to recognize NaVβ4 from rat, human, and mouse samples. Murenzi, E. et al. (2017) Neurotoxicology 60, 260.